I don't know how this sneaked up on me, but the second book in the Leviathan series comes out next week!! It's called Behemoth and the release date is Tuesday, October 5. The first book, Leviathan by Scott Westerfeld, was one of very favorites of 2009, if not one of my faves of the last two or three years. It's an alternative history story that asks what might have happened if the British and the German/Austrian armies of World War I had evolved radically different technologies. Scott Westerfeld uses this fascinating concept to tell a terrific story. Not only did Leviathan have the incredible Darwinist blended animals (including attack bats that poop iron spikes!) and the deadly Clanker machines, but it also had escapes, air battles, secret missions, and one massive thing that explodes! What more could a guy want in a book? So, naturally, I want to read this next one. The library system has already ordered copies. I've put one on hold and you can too. 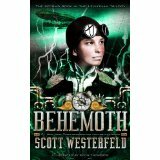 (it's easy--go to the library's home page and look up Behemoth on the catalog. Be sure to have your library card handy) I'm usually on top of new books and reserve them early but waited too long and now I find myself 14th in line. Oh, well, it could be worse--the Harry Potter books had 600 holds on them six months before they came out! So don't miss Behemoth!! Barking spiders, you'll enjoy it! PS--click here to see my review of Leviathan. 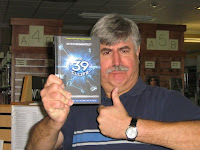 PPS--some of our brother readers at the SMS Guys Read blog got an advance copy and have already reviewed it. Take a look at their site and be sure to scroll down. The First Two Chapters of The Lost Hero--You GOTTA Read This! 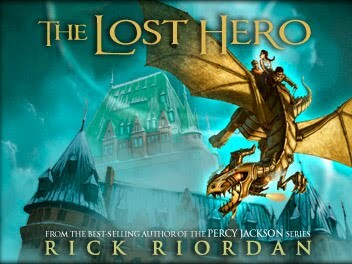 The incredible Rick Riordan has done it again!! 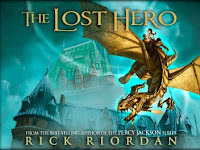 If you go to Rick Riordan's blog, (which you can find on the left-hand side of the page under "Links," you'll see a link to his new Heroes of Olympus site. If you click on the "About the Series" link, you'll see a "Sneak Peek" box. 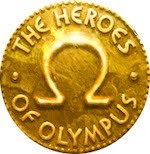 Click on that and you can read the first two chapters of The Lost Hero, the first book in the Heroes of Olympus series, which continues the adventures of the Camp Half Blood kids. Does Percy Jackson show up? Will you meet new campers? Well---you're just going to have to go there to find out!! I will tell you that you'll find all the excitement and humor you loved in the Percy Jackson books. If these two chapters are an indication of how the rest of the book will be, then this one will be un-believable!! The book comes out October 12 and the library will have copies. (although we may not have them on the shelves that day--it usually takes a while) I've got one on hold now!! CANNOT WAIT!! PS--there's also a link to the book trailer--take a look here. ...is a book that ROCKS and ROLLS!! This one, like all the 39 Clues books, really grabbed hold of me. I remember staying up late one night because I couldn't go to bed until I got all the way to the end. This is the final book in this fantastic series. Dan and Amy Cahill are closing in on the secret to becoming the most powerful people on earth. And so are their evil cousins, who will will stop at nothing to gain that secret. But not only do Dan and Amy have to keep it away form their unbelievable cousins, they also have to get the other four branches of the Cahill family to work together. Not an easy task, since they've basically been at war for 500 years! They must succeed, however, for the sake of the whole human race. Man, oh, man, will you enjoy this one!! There are ninjas, exploding underground tunnels, a confrontation on mountain top, and an all-Cahill family fight on the Globe Theatre stage! (And, I tell you, I have never been so scared for Dan as when he was dangling off the side of that enormous cliff!!) You can see that there's enough action and heart-pounding excitement to satisfy any reader guy. 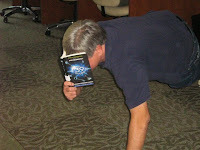 Plus there are MAJOR surprises--including one that will leave you wondering, "Is this really the end of the Clue hunt? Or only the beginning of an even MORE major adventure?" You'll ask yourselves the same question after you read Into the Gauntlet. Don't miss it!!! And if you don't believe me that this a terrific book, read what your fellow reader guy Michael said in the post under this one. All Right! MICHAEL Writes Again! Amy and Dan have recently met their great uncle, Fiske, and he has told them that they need to not only win the clue-hunt for the Madrigals, but to also accomplish the 500-year task of uniting all of the Cahill branches. WHAT!!! Alistair Oh and Jonah Wizard? Sinead Starling and Ian Kabra? Eisenhower Holt and Dan Cahill? Impossible! Or is it? And not to mention the most evil woman in the world: Isabel Kabra. Who will be the first through the gauntlet? Who will drink Gideon Cahill's master serum? Who is going to rule the world? No one could write the 39 Clues better than Margaret Peterson Haddix, and you're guaranteed to be on the edge of your seat the entire time! 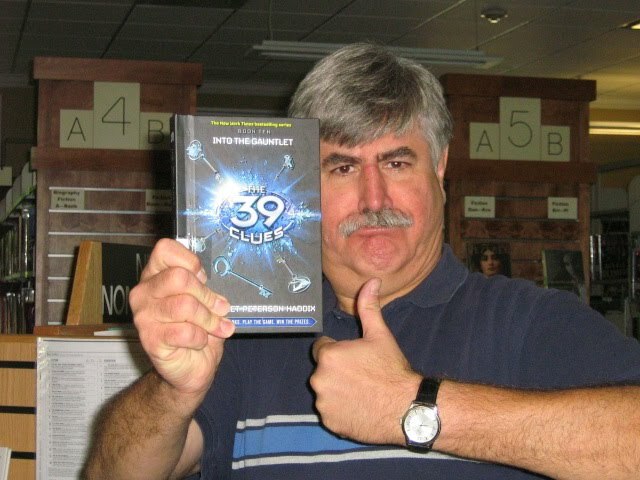 Also, look for the newest 39 Clues book coming October 26: The Black Book of Buried Secrets. Simon is back, and he's not taking any chances. After retreiving his goon, he hunts down a computer whiz perfect to do his bidding: Albert Nesbitt. Albert is a 32-year-old, 300-pound comic book reader who is just smart enough to make what Simon wants: a ray gun that hypnotizes electronic devices. Perfect! Now, not only can Simon drain the NERDS of their power, but he can use their power against them! And then Albert's Mama gets in on the scheme, and she's more evil then the other three combined. That's when Duncan Dewey (a.k.a. Gluestick) 's dad takes him off the team of NERDS. And if that's not bad enough, Albert's Mama knows that Duncan is a part of the NERDS, and she's his next door neighbor! And she's got the ray gun!!! What will happen now? Well, you'll have to find out by reading it yourself. I'm certainly not going to tell you. That would be spoiling it! This book is much better than the first and marks the end of Simon forever! After their huge success with Super Diaper Baby, George Beard and Harold Hutchins have decided to write another graphic novel. Ook and Gluk are caveboys in the year 500,001 B.C. The world is run by the evil Goppernopper. But then Goppernopper sees strange creatures hauling away all the trees. And that's when it happens. Goppernopper meets his descendant, who runs Goppernopper industries. He has used a time portal to come from the year 2222 A.D. to 500,001 B.C. to get all the trees for Goppernopper industries, because there are no trees left in 2222 A.D. Caveman Goppernopper agrees to help. Ook and Gluk, seeing the whole thing, know that the two Goppernoppers will take over the future world and the caveman world as well. The two boys run through the time portal into a world filled with pollution and manmade buildings. They take refuge in a martial arts school and in seven years advance to black belt. But is it enough to save all of space and time from the evil Goppernoppers? Or will the enemies prevail once again? Is this the end for Ook and Gluk? This is a great comic book, outrageously funny, and, regardless to the fact that a couple of 4th graders wrote it, is very accurate to time travel. A great read for everyone! Thanks, Michael! You beat me to the punch on a couple of these. I have Into the Gauntlet and am about one-third of the way through. It's really good so far. I just checked out a copy of N.E.R.D.S. 2 last week and it looks good too. The library has copies of Ook and Gluk in the system, so I've just put one on hold. You've given me something new to look at, Michael! Thanks again and keep writing! The Only Thing That Could Interrupt My Erec Rex Reading Is.. I have just received a copy of Into The Gauntlet by Margaret Petersen Haddix. All the secrets of the Clue hunt will now be revealed. Here I am with the book in the Charlotte, North Carolina stronghold, cleverly disguised as a library. (they we Tomas would never go into one!) I began reading the book immediately, which was not hard (even for a Tomas) because these books are full of action, action, and more action. Of course a good Tomas always works out, even when reading. Will give a full report when finished. Agent Flexing bear signing out.